​For more information call 724-5375 or email Environmental EducationJoin the active volunteers working in Pima County’s Tucson Mountain Park, Cienega Creek Natural Preserve, Agua Caliente Park, Canoa Ranch, and other Pima County Parks. There are a variety of volunteer positions available with Pima County’s Environmental Education and Interpretive programs. Tour Guides for the Agua Caliente Park Ranch House Visitor Center and Art Gallery. Volunteers meet and greet visitors and lead tours of the historic ranch house and grounds. Volunteer Naturalists lead or assist with nature walks, birding and other wildlife viewing programs at Agua Caliente Park, Tucson Mountain Park, Cienega Creek Natural Preserve, Canoa Ranch, Sweetwater Wetlands and along the Santa Cruz River, Colossal Cave Mountain Park, and other locations in Pima County. School and Youth Program volunteers work side-by side with NRPR educators to engage students in science study and nature-based activities at Agua Caliente Park, Tucson Mountain Park, Pima Prickly Park, and along the Santa Cruz River. Buffelgrass Speakers’ Bureau volunteers deliver educational presentations to local community groups to raise awareness of buffelgrass and other invasive species. Living with Urban Wildlife volunteers receive training to deliver digital slide presentations that offer practical tips for coexisting with wildlife in the urban setting. Volunteers work with NRPR educators to engage the public at large community events and make use of the interactive features of the mobile Living with Urban Wildlife exhibit. Sonoran Desert Weedwackers is a volunteer group dedicated to removing infestations of buffelgrass, fountain grass and other invasive plants found in the Tucson Mountains and other natural areas in Pima County. Weedwacking is hard work but the benefits are well worth the effort! Volunteers should be in good physical shape and able to hike on uneven terrain. Volunteer groups can apply for a Pima County Roadway Invasive Weed Removal permit to remove buffelgrass and fountain grass along roadways. Volunteer groups must follow safety guidelines, have a designated leader and obtain a roadway permit. Pima County will provide safety vests, tools, and bag pickup. ​​Call 724-5220 or email Canoa Ranch for more information.​Volunteer Tour Guides interpret Historic Canoa Ranch's preserved and restored historic buildings and landscapes, cultural history, and natural resources for scheduled groups and the general public. Volunteers assist NRPR staff with light restoration and construction work on the buildings inside the historic heritage areas. Projects will include surface preparation prior to painting interior and exterior walls on buildings and other landscape elements. Light wood working projects including surface preparation and general repairs prior to re-staining wooden surfaces on both interior and exterior locations. Repair and restoration of the retaque corral areas including repair or replacing damaged materials in the fencing and gates. 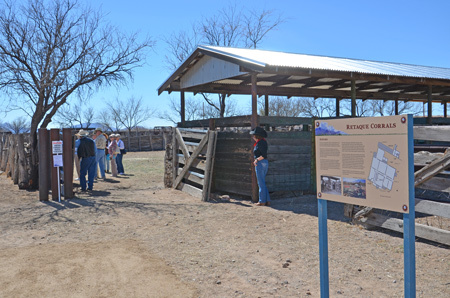 Volunteer Tour Guides will lead visitor tours of the restoration activities underway at Historic Canoa Ranch. They will interpret the preservation and restoration work on the historic buildings and landscape to groups and the general public. ​For information on how to get involved, please email Neil Stitzer or call 724-5239Do you enjoy trails and appreciate the experience they provide for getting out into Pima County’s natural open space parks? Are you interested in volunteering to help build and maintain these trails? Participating in volunteer trail projects is a great way to sustain trails, not only for yourself, but for the entire Tucson community. Volunteer trail projects include new trail construction, trail and trailhead maintenance, sign installation, and rehabilitation of old trails and roads no longer in use. Current opportunities are available for group trail work events to help build new trail or becoming a trail steward for ongoing trail maintenance. With hundreds of miles of trails in many areas surrounding Tucson and more new trails planned, there is never a shortage of trail work. Whether you’re a hiker, runner, mountain biker or equestrian, there’s a good chance you’ll find that working on trails is even more rewarding than using them. No previous trail work experience required. Work is physically strenuous; volunteers should be in good physical condition and able to hike on uneven terrain. For more information please contact Jessie Byrd or at 488-8022.Volunteers at the native plant nursery help grow native plants and cacti for public projects. Planting, watering, weeding - we always have things to do at the nursery. Take home a free plant in exchange for your volunteer time! The nursery is located at 5845 N. Camino de la Tierra and we are open Monday thru Friday, 6:00 a.m. to 2:30 p.m. I'm currently a volunteer at the Pima County Native Plant Nursery. The Nursery provides a valuable service to the County by propagating, nurturing and supplying native plants for street divides and other public spaces. They also rescue native plants (primarily succulents) from public and private property destined for development. For a couple hours each week, I assist the staff in virtually every required function on site from watering, planting, up potting (bumping) to preparation for delivery to project sites. This is definitely NOT volunteer "busy work" but rather necessary help for their very small paid staff. In addition to general volunteer satisfaction, I have a concentrated opportunity to learn about virtually every Arizona Uplands native plant. I also gain a tremendous amount from discussions with professional botanists, horticulturists, and irrigation specialists. ​For information contact Program Manager, Kelly Cheeseman or at 724-5208.There are a variety of seasonal volunteer opportunities working at Pima County swimming pools and community centers, including the Mt. Lemmon Community Center, and year-round volunteer opportunities in the shooting sports program. Have a group of five or more people, and looking to give back to your community at no personal cost? Consider adopting a site with Tucson Clean and Beautiful's Adopt-a-Park and Public areas program, check out their website for more information.